THE SOCIETY OF SCOTTISH ARMIGERS, INC. The Society of Scottish Armigers, Inc. (SSA), was established in 2001 as a non-profit, California corporation which has been recognized by the United States Internal Revenue Service as a not for profit organization, i.e., 501(c)(3). The Society has several levels of membership – Individual (regular, junior and associate) and Organization Membership. Individual Memberships are limited to those people who (A) possess Scots Arms (regular or junior), or (B) who are in the process of acquiring Scottish Arms or whom the Board of Governors otherwise wishes to honour (associate). Scottish Armigers are individuals (1) whose armorial bearings are recording in the Public Register of All Arms and Bearings in Scotland as either an original grant or matriculation of arms; or (2) who are entitled to use their parent's or grandparent's undifferenced arms that are recorded in the Public Register of All Arms and Bearings in Scotland as either an original grant or matriculation and, if living, debuised with either a three-point or five-point label (i.e., the three-generation matriculation rule) [Sir Thomas Innes of Learney, Scots Heraldry, Edinburgh: Oliver and Boyd, 1956 (2nd edition), page109]. Organization Memberships are limited to organizations with Scots Arms that have purposes consistent with the Principles of the Society; normally, this includes Clan Society and Celtic/Gaelic professional, educational and cultural organizations. Associate and Organization Memberships are non-voting categories of membership. 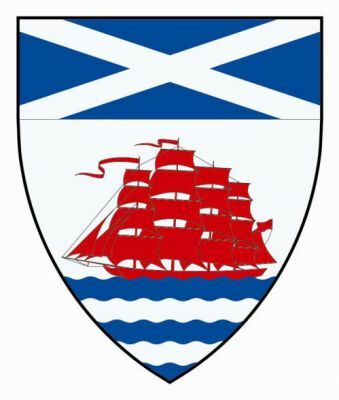 The Mission of the Society is to provide the Scottish-American and Celtic/Gaelic Community with an educational service organization capable of providing guest speakers knowledgeable in the various customs and traditions of Scotland, thereby providing for a better understanding of Heraldry, Clan Law, and the many and varied traditions that represent Scottish Culture. For regular and associate individual membership there is a one-time application fee of $100.00 [USD] for membership that includes the first year's dues. Annual dues are currently $30.00 [USD] and are due January of each year. For full regular membership please include proof that you have Scottish arms (as defined above), i.e., a digital photograph and typescript of your grant/matriculation document, etc., along with your curriculum vitae or a short biography with the application. Associate membership, for those seeking Scottish arms, please include a signed/dated copy of your petition for arms, a short biography and proof of your petitions receipt at Lyon Office with the application. Associate membership is also open to spouses and children of SSA armigers, and those with a demonstrated interest in Scottish heraldry. The same application fees and dues apply as with regular memberships. Junior membership is open to those individuals who are entitled to use their parent’s or grandparent’s undifferenced arms that are recorded in the Public Register of All Arms and Bearings in Scotland as either an original grant or matriculation and, if living, debruised with a either a three-point or five-point label (the three-generation matriculation rule) and a short biography. Junior members only pay an application fee of $50.00 [USD] and are waived for paying annual dues until their 18th birthday at which time they can choose to remain members and pay annual dues or drop their membership. For Organization Membership there is a one-time application fee of $300.00 [USD], for membership, which includes the first year's dues. Annual dues are currently $50.00 [USD] and are due January of each year. In all cases, membership applications will be presented to the SSA Board of Governors for approval. We look forward to hearing from you and working to further the knowledge of Scottish Heritage and Culture. SSA encourages its members to support The Heraldry Society of Scotland (HSS) by joining their Society and having their armorial bearings posted on the HSS web site: (www.heraldry-scotland.co.uk). For further information contact HSS. I wish to apply to become a member of the Society of Scottish Armigers and agree to be bound by its Constitution and Rules. (A) Regular Membership is limited to Scottish Armigers, i.e., individuals (1) whose armorial bearings are recorded in the Public Register of All Arms and Bearings in Scotland as either an original grant or matriculation of arms; or (2) who are entitled to use their parent’s or grandparent’s undifferenced arms which are recorded in the Public Register of All Arms and Bearings in Scotland as either an original grant or matriculation and, if living, debruised with a either a three-point or five-point label (the three-generation matriculation rule). (B) Associate Membership is limited to the spouses and children of members and certain others with a demonstrated interest in Scots Heraldry or whom the Board of Governors especially wishes to honour; however, the latter part of the category may not exceed 10% of the regular membership. There is a one-time application fee of $100.00 [USD] for regular and all associate memberships, which includes the first year's dues. Annual dues are currently $30.00 that is due each January [except junior members under age 18]. Please include with your application either your check made out to the Society of Scottish Armigers or a copy of your payment via the SSA website PayPal system. Note: you do not have to have a PayPal account to use the SSA website PayPal option. 1. For regular membership, please include proof that you have Scottish arms (as defined above), i.e., a digital photograph and typescript of your grant/matriculation document, etc., along with your curriculum vitae or a short biography. Your application will then be presented to the Board of Governors for approval. 2. For junior membership, please include proof that you or your parent or grandparent have Scottish arms (as defined above), i.e., a digital photograph and typescript of your grant/matriculation document, etc., along with your curriculum vitae or a short biography. Your application will then be presented to the Board of Governors for approval. Note: The junior membership application fee is $50.00 [USD] and the junior member does not pay annual dues until they reach the age of 18 years and parents or grandparents may submit the junior membership application for junior membership. 3. For associate membership, for those petitioning Lyon Office for Scottish arms, please include a signed/dated copy of your petition for arms, a short biography and proof of your petitions receipt at Lyon Office. For all others seeking associate membership, please attach a letter outlining the reason(s) you desire to become a SSA associate member. Your application will then be presented to the Board of Governors for approval. We wish to apply to become an organizational member of the Society of Scottish Armigers and agree to be bound by its Constitution and Rules. Furthermore, we understand and acknowledge that membership is considered only for those organizations that have purposes consistent with the Principles of the Society; normally, this includes Clan Society and Gaelic professional, educational and cultural organizations. We further understand that organizational members constitute a non-voting category of members. Please complete the following organizational details. For United States organizations, what is your Employer Identification Number: __________________. Are you a 501(c) organization? ______. If so, under what subsection, e.g., (3), (4), (6), (7), (13), (19) etc. : _____. If you have arms, are they record in the Public Register of All Arms and Bearings in Scotland. If so, please indicate in which Volume _____, Page ______ and date grant ____________. Also, please include a JPG copy of your arms as well as a copy of your grant document. Please note: There is a one-time application fee of $300.00 [USD], for membership that includes the first year's dues. Annual dues are currently $50.00 [USD]. Your application will be presented to our Board of Governors for approval.